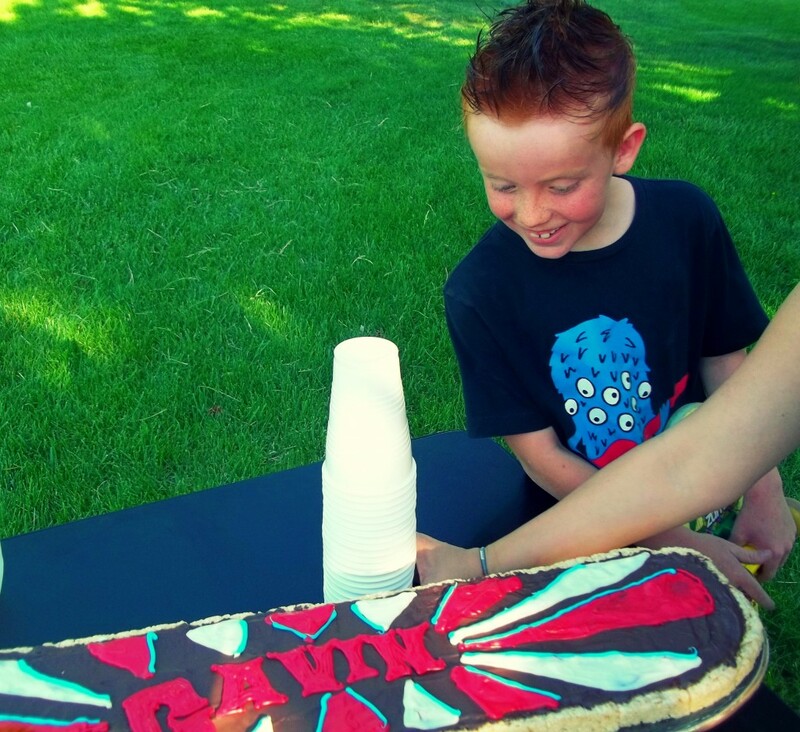 Gavin, the skater, just turned 9. He wanted something made with Rice Krispie Treats. So we took a really easy, tasty route. I used about 48 pre-made Rice Krispie Treats. Dave picked up a real skateboard with metal trucks at Target to use as a stand. I wrapped it with platic wrap and sort of smooshed the treats up together on the board, trimming the ends to follow the shape of the board. Then I smoothed Wilton’s melting candy over the whole thing. 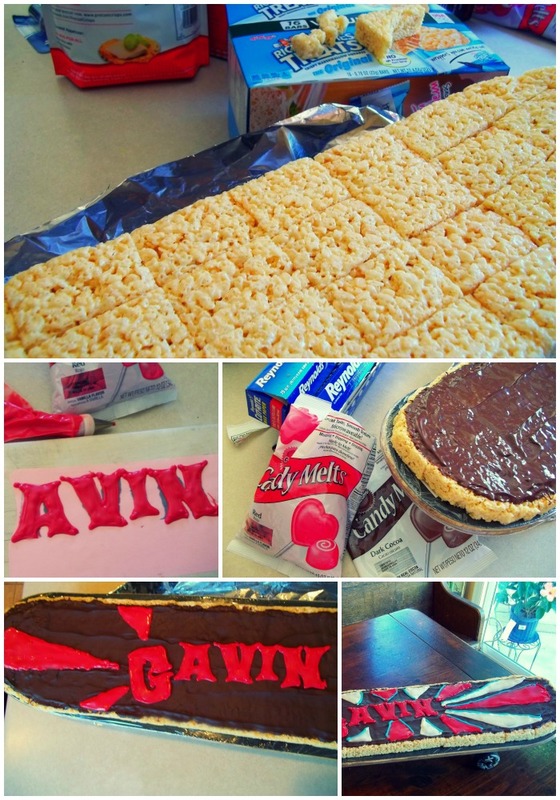 While it cooled, I melted some of the red and piped/traced Gavin’s name over a template I had made, which I covered with wax paper. I popped his name in the fridge to cool. In retrospect, perhaps I should have used a mini spatula to smooth it out, but it is a casual cake. Just before the chocolate covering was totally set, I placed Gav’s name on the board and Dave piped sort of a sunburst design on it. Peeled the letters off the wax paper and placed them on the chocolate-candy-coated board. 20 minutes in the fridge and voila! Gavin told me he ate A LOT of Rice Krispie Treats. A lot. 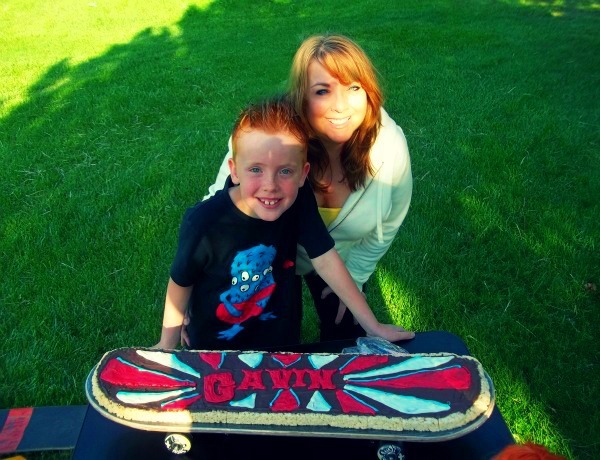 We had a lovely time at the park, Gavin and his little sister and all the rest of us! That looks great! I am sure it will be asked for again. I love the idea of using premade. The older I get, the more I like the short cuts. Especially when then look as good as yours.